You've heard of speed dating..... well this is speed planting. 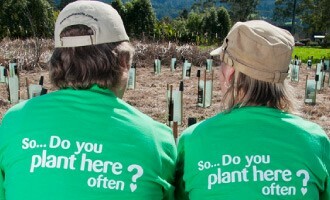 Landcare for Singles events provide the perfect opportunity for environmentally conscious people on the look-out for that special someone to try a new and unique form of speed dating, or in this case – speed planting. They are also a great way of attracting new volunteers to your group and spreading the word about the great work your group is doing for your local environment. 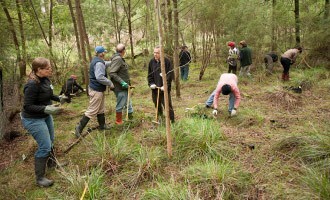 The inaugural Landcare for Singles speed planting events were run by the Yarra Valley and Dandenong Ranges Landcare Network in Victoria in 2011 to address recruitment issues for Landcare groups in the area. The Network ran two hugely successful planting days, which attracted over 100 participants, 95% of whom were completely new to Landcare. An after-party was also hosted, giving the opportunity for all singles from both planting events to come together and mingle. Visit www.landcareonline.com.au for more information or to get involved or follow us on Facebook for information on these outrageously fun events!